Doppo White Beer for Oyster (what a catchy name!) 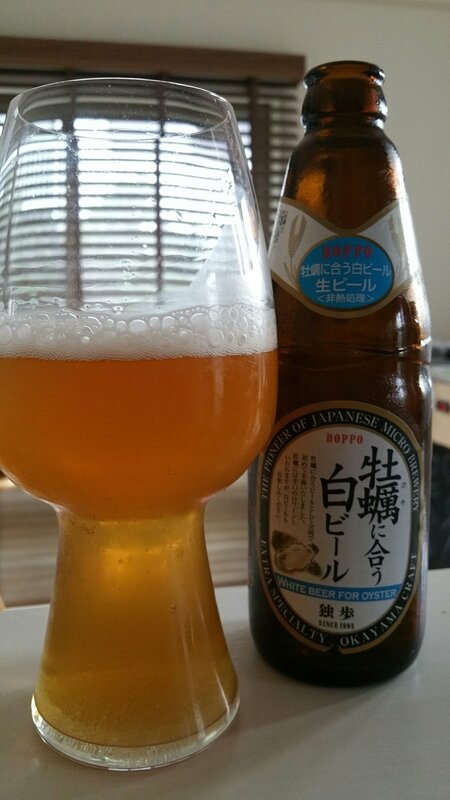 is a 5% German hefeweizen from Miyashita Shuzo, based in Okayama, Japan. It’s available all-year round, primarily in bottles, though we have seen it on tap across Kanto. Rather than being a beer that has been specially designed for local oysters, the brewers took a recipe from Germany and have used speciality wheat malt in making Doppo White Beer for Oyster, which has a reduced level of sweetness, allowing you to really taste those oysters. It’s supposed to resemble something like a Chablis along with the gassy nature of champagne. Bland as Asahi super dry. Great if you really want to taste the food. Without making too many puns, Doppo White Beer for Oyster is a mouthful of a name and I really couldn’t imagine ordering it in a bar, even with it’s catchy Japanese name too. It poured out a golden amber colour with a small amount of frothy white head that faded fast to a thin layer of bubbles on top. It didn’t have your usual banana or clove aroma to it, nor was it sweet – I guess the brewers got the description right. In fact, it had a slight sour nose to it but not much else was going on – hops were either non-existent or couldn’t be bother to show up. If you’re eating oysters, then why would you want a beer? Perhaps you’d eat them with a nice crisp white wine, or some champagne if you’re feeling flush, but a beer? I guess with Doppo White Beer for Oyster, the brewers tried to make something dry, which they have succeeded, but was devoid of any flavour – so you might as well drink some Asahi Super Dry instead of this beer, thus saving you some money for more oysters. The only distinctive flavour going on in Doppo White Beer for Oyster was a slight sour tartness to it but even then, that faded fast. If you’re going to eat oysters and want a beer, then drink some white wine or champagne. I wouldn’t recommend Doppo White Beer for Oyster for drinking with anything.